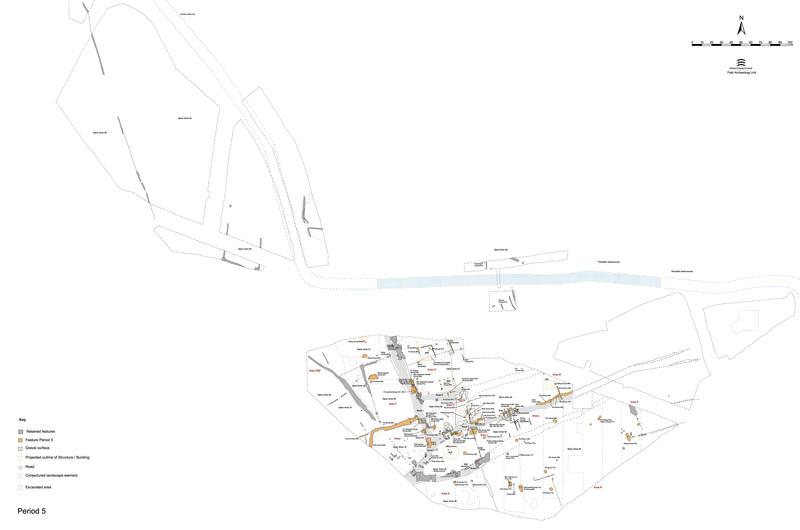 OA50 continues to be devoid of buildings in the Late Roman period and the deliberate infilling of well 14984 would seem to emphasise its increasingly marginal nature (Figure 188). While tangible signs of occupation disappear from OA50, pits continue to be dug and subsequently infilled with a mixture of domestic and manufacturing debris. 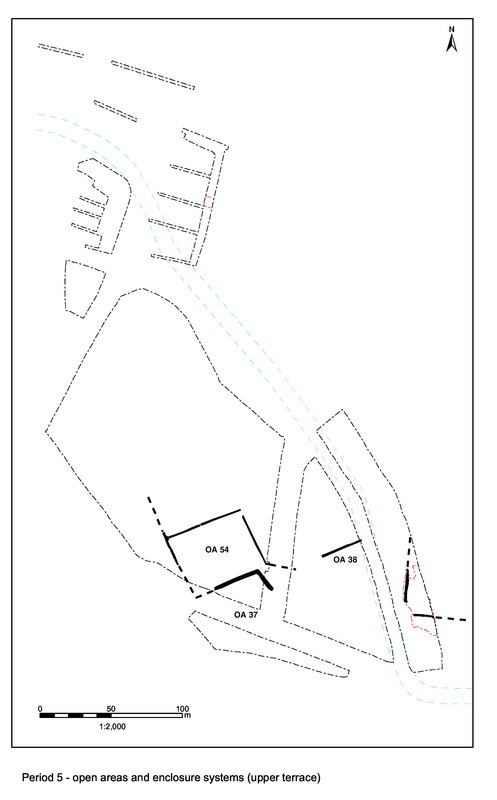 As nothing of Period 5 date is identified within Excavation Area Q (formerly the Eastern hinterland), it may possibly be merged with OA50. The primary evidence for an increased manufacturing use of OA50 is described here. 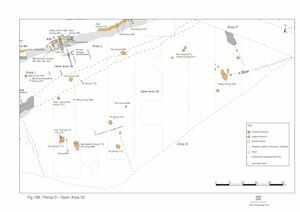 On the western side of Open Area 50, mid-2nd century well 14984 (Group 710) passes out of use by or during the earlier 4th century AD and is backfilled (Group 713) (Figure 157). 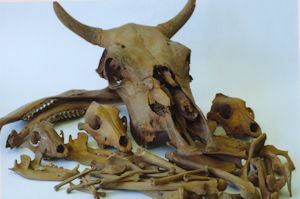 The carcasses of at least four dogs, a cow, and young pigs, sealed by selected capping deposits, are deposited within it (Figure 200). This could suggest a deliberate, ceremonial closure of the well particularly as the fills do not contain a significant rubbish component (quantities of pottery are particularly low). The presence of copper-alloy artefacts such as a key (SF6274) and cosmetic pestle (SF7345) may perhaps support a ritual aspect to the closure of the well. 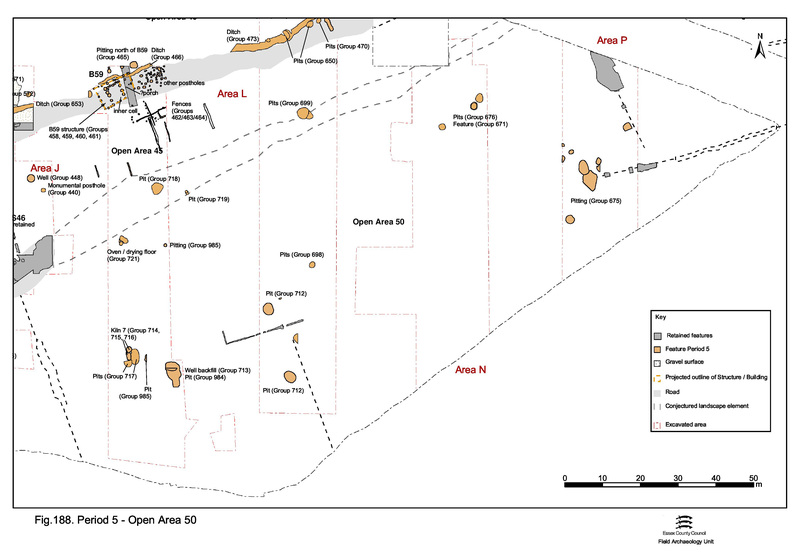 In the western part of Open Area 50, pitting (14899, 14919, 14992 Group 717) follows a similar pattern to that of the preceding period, with a combination of small single pits and larger examples that tend to inter-cut. These pits pre-date kiln 14858 (Group 714), are most likely to date to the late 3rd or early 4th century AD, and both residual and intrusive material is present in their fills. Further east lie Late Roman pits 15738, 15856, 15868, 24094 (Group 698) and, beyond them, pits 10910 and 11713 (Group 676) flanking a feature (11303 Group 671) that may be a pit or merely a product of slumping into the underlying Period 2B well. All these features are small (c. 2m diameter, with depths of 0.33-0.66m) and round to oval in plan. Despite their relatively limited capacity, their fills contain large and varied assemblages that appear to be a mixture of demolition and domestic debris. Demolition is represented by quantities of tile, plaster, mortar and opus signinum, particularly in pits 10910 and 11303. Domestic activity is denoted by animal bone and pottery and personal items such as a jet pin (SF5768) and bone pins (SF5772, SF5776) from 10910, and a buckle (SF6976) from 11303. A spindlewhorl (SF5771) comes from 10910. In addition, pit 11713 contains a fragment of litharge (SF7009) and 11303 an iron ingot, and a large number of other iron objects, mostly unidentified, all of which hints at Late Roman metalworking in the vicinity. Box fittings (SF5769 from 10910) and even a padlock barb spring (SF6977 from 11303) could represent some of the items being fashioned, or personal belongings of the inhabitants. A mould fragment in pit 10910 is thought to be residual and derived from the Period 2B metalworking activity. A strand of continuity between Periods 4 and 5 is again evident in the siting of pits. For example, pit 10910 cuts into the top of Period 4 pit 10953. This impression is reinforced by the similarity of finds assemblages between the two periods. Pit 14924 (Group 984) post-dates the backfilling of well 14984. Further pits (14671, 20035 Group 985) lie between the infilled well and kiln 14858 and date to the 4th century AD. 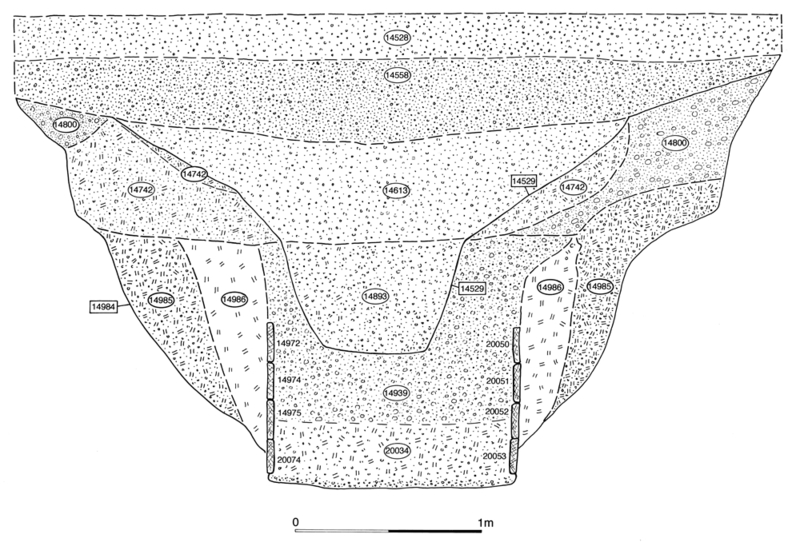 Pits or post-holes (20271, 20273 Group 719) lie on the southern edge of former Road/track 3 and generally only contain modest amounts of pottery, bone and tile. Pitting in the centre of Open Area 50 - Excavation Area M - (15755, 24004 Group 712) continues the trend of large and diverse finds assemblages from Period 4 and includes a significant metalwork content (both iron and copper alloy) as well as large quantities of pottery, tile and animal bone. Although pit 24004 contains mid- to late 2nd century pottery, the presence of two mid-4th century coins suggests that it is probably a late pit containing largely residual material. Its shape and proportions mirrors those of other Period 5 pits. It may be cut into the top fill of pit 24072 (Group 709 Period 4), though the truncation if any is slight and the relationship is not entirely secure. 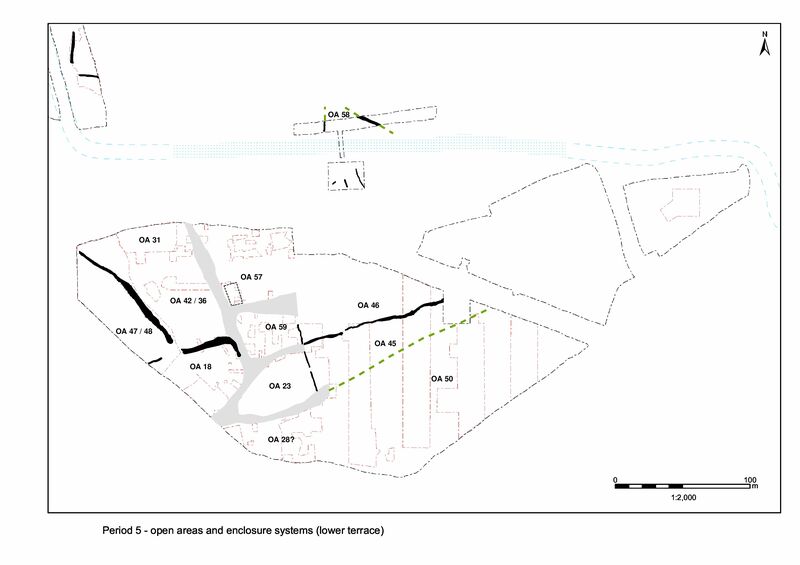 In the eastern part of Open Area 50 (Excavation Area P), the Late Roman pits (8555, 8639, 8726=8727, 8745, 8956, 8966, 8972, 19136 Group 675) cluster in a distinct band either alongside or at the end of Period 4 ditch 25177 (Group 668), suggesting that, even if the ditch is already filled in, its line may still be perpetuated by a hedge or at least remain visible. These Period 5 pits are consistently larger than those dug in Period 4. However, the fact that pits continue to be dug in the same location may indicate a general continuity of activity between the 3rd and 4th centuries AD. Pit 8555 is notable for the ten coins (the latest of which is dated to AD 347-348 SF6021) found in its top fill, which could be the remains of a hoard or an otherwise structured deposit. One discontinuity is a change in the finds assemblages from the pits. Much larger quantities of tile were now present and, perhaps significantly, metalwork, even minor items such as iron nails, was conspicuously absent. If the presence of nails is interpreted as evidence for the demolition of wooden structures nearby, this might suggest that the density of buildings in the vicinity is indeed diminished. Pit 14924 (Group 984) post-dates the backfilling of well 14984. Further pits (14671, 20035 Group 985) lie between the infilled well and kiln 14858) and date to the 4th century AD. 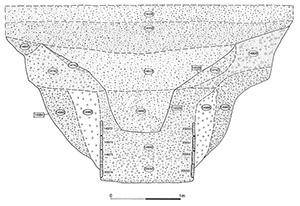 Pits or post-holes (20271, 20273 Group 719) lie on the southern edge of former Road/track 3 and generally only contain modest amounts of pottery, bone and tile.